Budapest is a beautiful city but if you’re getting sick of the fast pace of the city why not take a day trip out of the city. Of course you can take one of Budapest tours, but there are numerous beautiful towns, villages, lakes and wine regions around Budapest to visit. 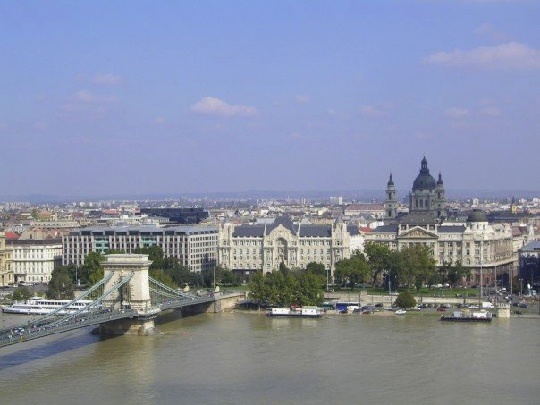 Hungary is not a large country so there is no excuse of not venturing out of Budapest. You will not only be escaping the bustle of the city but you will have the opportunity to learn more about the history and culture of the Hungarian people. Here are five places you should visit for a daytrip. The Baroque city of Győr lies halfway between Budapest and Vienna. A popular tourist destination as well as a cultural center it is about an hour’s drive from Budapest. There are many sights to see in the city such as Káptalandomb (Káptalan Hill) and the Baroque squares of Bécsi kapu tér and Széchenyi tér. It is also a great base to make excursions to the Pannonhalma Monastery, the oldest historical monument in Hungary and to one of Hungary’s many wine region. Both are not far from the city. This quiet town is located to the west of the Danube. This was once an independent town. The style and décor of the houses and surrounding areas makes it feel as though you have been taken back to 19th century. You can choose from a range of enchanting restaurants to try out the tasty Hungarian cuisine. Further north from this town you can visit the ruins of Aquincum, the Roman baths at a natural mineral spring site. Outdoor swimming pools fed by the thermal springs are provided during the summer months, a great way to relax after the day of sightseeing. As Hungary is landlocked, this lake is also known as the ‘Hungarian sea’. Lake Balaton is the largest freshwater lake in Europe and millions of tourists flock here every year to enjoy the warm water. It is about an hour away from Budapest so makes a great day trip. On the south of the lake you can find the popular destination of Siófok, known as the ‘Party Capital of Hungary’. The hills on the north provide amazing views and here you can also find some fantastic wineries. There are number beaches around the lake which are open from May to October. At most of the beaches you will find playgrounds, showers, lockers etc. Some of the beaches you have to pay an entrance fee, but there are some free beaches so you just have to look around. Some of them also offer activities such as kayaking and surfing. If you are a big wine fan, a day trip to Etyek-Buda wine region will be an enjoyable experience. There are many wine regions around Budapest but this one is the closest so more suitable for a daytrip. Known for making sparkling wine, this region offers some top quality wine. Just over an hour away from Budapest, this old-style town is famous for its annual Easter Festival. It is home to the Palóc people, an ethnic minority group in Hungary. A world Heritage Site, its famous folk architecture consists of a wooden church and 58 snow-white houses. Its medieval castle is also popular among tourists. The Easter Festival is so unique because it stills follows the old folk traditions. To see the traditions, culture, costumes and architecture of the Palóc people is the main reason to come here and what makes it a unique experience for a visitor.